Our plastic surgeon, Dr. David L. Durst, receives many requests for treatment in the chin region. These patients usually have a little bit of fat underneath the chin or a weak jaw line. If you have an interest in a chin and neck procedure, please call our office to request more information. The chin and neck procedure is different from the facelift. The chin and neck procedure corrects loose skin underneath the neck in some situations but is better for treating small fat deposits. Also it can help correct an area where there is some weakness to the appearance of the chin. It however does not have the same effect as a facelift. It is not nearly as dramatic a procedure and therefore, Dr. Durst must examine you to determine which procedure would work best for you. Sometimes you may be looking for just a little bit of a change and an anterior neck procedure can be very dramatic but when there is loose skin in the jowl region, an anterior neck procedure by itself will not work and may potentially make things look worse. In that situation, a full facelift is necessary. The chin and neck patients are usually in their 20s, 30s and 40s. You should be healthy and not significantly overweight. A small pouch in this area that bothers you particularly in profile pictures can be very nicely corrected often with just a liposuction procedure alone. If the jaw line is weak, consideration for a small chin implant could result in a dramatic difference as well. The chin and neck procedure is generally done with general anesthesia but sometimes can be done with local anesthesia in our surgical facility in the office. The incision lines are underneath the chin in the natural crease in that area. Afterward, you go home the same day and are surprised that the procedure is not very sore. A support garment is worn for several days. You would normally take three or four days off work and then could be back to work and actually look pretty good at that point. Light exercising is begun two weeks after the surgery. 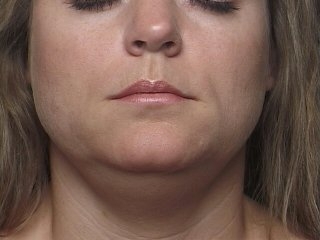 Our before-and-after photo gallery demonstrates some chin and neck procedures. Please contact the office to schedule a consultation to see if a chin and neck procedure would be perfect for you.